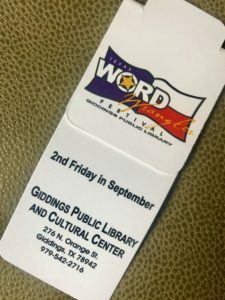 The Texas Word Wrangler Festival, benefiting the Giddings Public Library and Cultural Center. It’s never easy to travel out of town for a school or book engagement. I have to consider mileage/gas costs, hotel rates, meals, and other logistics. 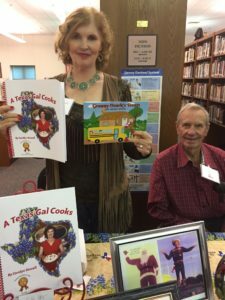 But when I was invited to feature my children’s book at the 13th Annual Texas Word Wrangler Festival—benefiting the Giddings Public Library and Cultural Center—I had to say YES! This resulted in a two-hour drive, a two-night stay … and a lot of fun. Arthur Zarr’s Amazing Art Car loves a good road trip! 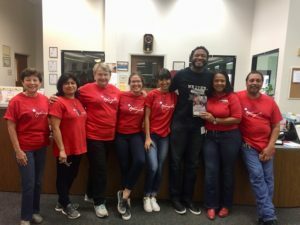 Author Jonathan Oliver poses with staff members of the Giddings Public Library. The first stop was an author visit where I spoke to third graders at Giddings Elementary School. I gave four presentations back-to-back, and after the last talk the teachers said they were having so much fun they didn’t want to leave! So, I stayed a bit longer, answering the many hilarious questions that the students had for me. It was AMAZING! Thank you for the beautiful drawings and artwork, St. Paul Serbin students! My second school visit took me to a beautiful facility with the most gorgeous cemetery nestled in a secluded, rural area. 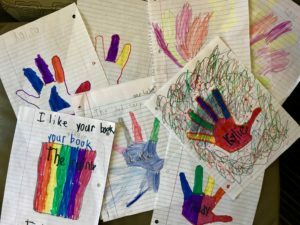 There, I gave two presentations for K-5th graders at St. Paul Serbin Lutheran School, and the kindergartners presented me with a stack of colorful, beautiful artwork. I love receiving handmade drawings such as this, and I’ll keep them forever. The next day was full of book sales at the library. School after school poured through the doors as students were brought by the busload for field trips to meet the authors. The children lined up for autographs, bookmarks and books. I signed one girl’s book and wrote “Be Amazing!”—as I always do—and she nudged her friend, whispering, “Can you beeee-lieeeeve it? She wrote ‘Be Amazing’ in my book!” My feet were aching but my heart was full! “A Little Bit of Nonsense” was there! This year, it was Alan Bourgeois’s idea to add a new Saturday event to the festival, complete with food trucks, snow cones, cotton candy, kiddie train rides, a jumpy-bouncy house, and MORE book sales. 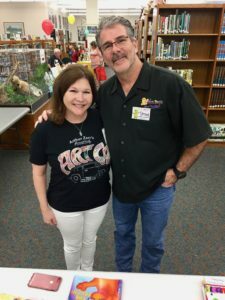 Alan is founder of the Texas Association of Authors and is a long-time supporter of the Texas Word Wrangler Festival; his efforts helped the library create what we all hope will be a new Saturday tradition. 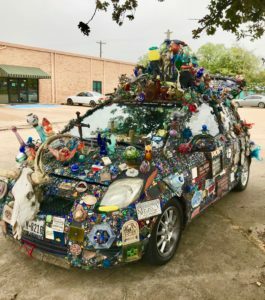 I invited Randy Blair to bring his art car, “A Little Bit of Nonsense,” to the festival, allowing visitors to see and touch a REAL art car up close. Randy and his car were a hit! 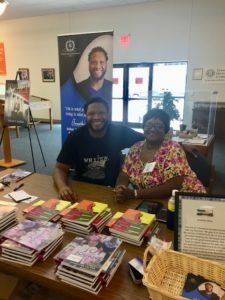 One of the best results of this weekend event was rubbing elbows with the other featured authors. I met so many smart, creative professionals, and it was wonderful to exchange ideas and knowledge. It was an amazing weekend full of irreplaceable moments, and I’m glad I was welcomed and honored by the warmth of the people of Giddings, Texas. Cick here to see the WORD WRANGLER festival website. Below I’ll post as many photos as I can of these talented writers who were in attendance with me. 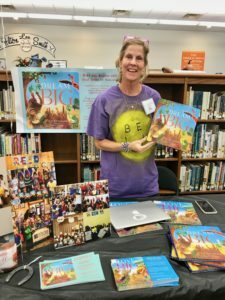 Kat Kronenberg of Austin, Texas is author of “Dream Big,” and her next book “Love Big” will arrive soon. Here I am with Harry Capers of Sugar Land, Texas, author and illustrator of the “Dino Buddies” series of children’s books. 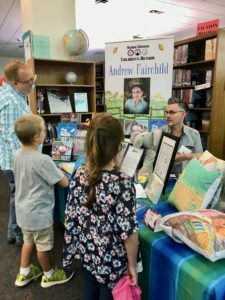 Andrew Fairchild of Texas City, Texas is an award-winning author of many children’s books. 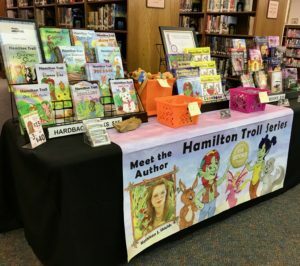 Kathleen Shields wowed the children with her “Hamilton Troll” series and other books, too. P.G. 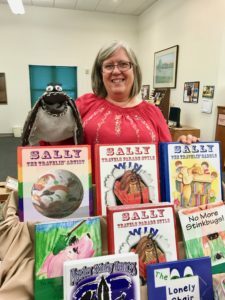 Shriver is author of the “Sally The Travelin’ Saddle” series and many more books. 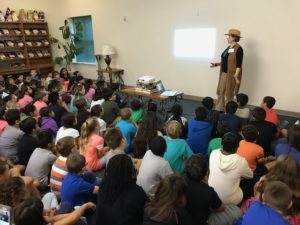 Mystery writer Kathryn Lane spoke to 100+ students in Giddings, Texas. 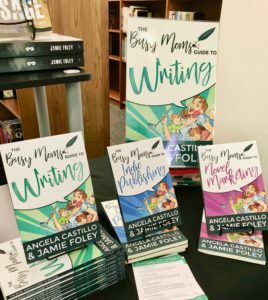 Angela Castillo and Jamie Foley are co-authors of the “Busy Moms Guide To” series as well as middle grade and young adult books of their own. I love this! It looks like a great few days. Thanks for sharing it with us! It was excellent to meet you too Cathey! I have a feeling we’ll be seeing each other again in our travels – a lot! Cathey it was such a pleasure to meet you and thank you for sharing such beautiful words about Word Wrangler and myself. I am truly blessed to do what I love and love what I do! Stay blessed! It was SO great to meet you, too! Hopefully we’ll cross paths again.